A quarter of a mile from where Newark's first settlers landed 333 years ago, Newark's rebirth is taking shape with the construction of the new Bears stadium. When it opens, it will mark the return of minor league baseball to town. At the core of the city's historic riverfront and hub of the area that was home to 19th and 20th century industrial Newark, the site is being prepared for the re-emergence of Newark as a sports town in the 21st century. Along with Newark's industrial, commercial, transportation, medical, higher education and cultural facilities, one devoted to sports is about to become a reality. While problems related to the project need to be solved and obligations kept to citizens old and new, the overall possibilities for co-existence appear limitless in 'America's biggest little city.' The site of the Newark Bears stadium includes an area between Broad Street and McCarter Highway, bounded on the north by Division Street and the south by Bridge Street. It has been an important location since the founding of the city, ready to become a major focal point again with the completion of the baseball stadium. In the 17th century, the area was part of the Passaic River 'highway,' easily approachable by ship or boat. Earliest illustrations indicated it had great homes along its banks. Just imagine what the Plume House, now part of the House of Prayer on Broad Street looked like with an unrestricted view of the river, surrounded by apple and peach orchards. Although the area was an agricultural site at one time, industrialization was never far away. At First River, today's bricked over Seventh Avenue, the township's first mill was constructed in the 17th century. Today's Washington Park was established as the city's market place and included leather manufacturing at the site. At the bottom of the hill, at what is now McCarter Highway, was the home of the township's ferryman, whose duty it was to transport passengers across the Passaic until the first crude bridge was built in 1794. From this spot, stagecoach traffic traveled to Belleville, Paterson and Bloomfield. As an important entrance into Newark, the location also ensured the growth of the town in its competition with other Passaic River communities. It was also where Lafayette, Henry Clay and Andrew Jackson entered town on their landmark visits. Almost 50 years later, the northern boundary of the area was marked by the railyards and freight station of the old Morris and Essex Railroad. At the river's edge, several companies shipped their products to their customers. Thirty years before the Civil War, wagon traffic, stagecoaches and a railroad were carrying locally produced goods from factories on this site. Understanding the history of the site of the new stadium requires a look at several early maps and city directories. In 1850, a map by Marcus Smith for J. C. Sidney shows the area fairly evenly divided between industrial and residential uses. Along Broad Street were homes owned by Newarkers including the Vanderpools, Vanderhoffs, Miss Moore (probably a boarding house) and Dr. L. Ward. 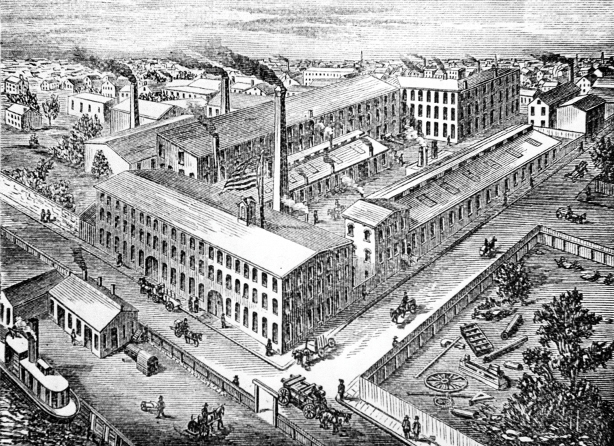 The area around Orange Street was divided among several important foundries, including the Newark Foundry and the Union Works at Spring Street which has since disappeared. The Hewes and Philips machine and tool works included a building that was still standing last year at the foot of Orange Street. At the northern edge of the stadium and in the middle of the spot where the Lincoln Motel now stands, was the freight yard of the old Morris and Essex Railroad. Of all the enterprises in the area, the oldest was 'The Crucible' of Newark's iron industry, the factory run by Seth Boyden, recognized as the first malleable iron foundry in the United States. According to an historic account, 'Boyden was involved in the production of malleable iron castings until 1835, at which time the Bridge Street foundry was sold off and the versatile industrial inventor moved on to other endeavors.' After the sale in 1838, Daniel Condit and Joseph A. Bowles took over the operation and advertised themselves as 'successors to S. Boyden.' By 1850 they employed 40 men. Condit became the sole proprietor of the foundry from 1855 through the Civil War. At that time the company passed under the control of John H. Barlow, who advertised 'the company' as the oldest Malleable Iron Foundry in the country. The company later moved to New Jersey Railroad Avenue, and Avenue A, near the present McCarter Highway. In the 1930s, the Barlow Foundry merged with Louis Sacks Iron Foundry, a company that remained active until the 1950s. In 1927, part of the Barlow Foundry Buildings was taken over by the Alderney Dairy Company and used for warehouses. The NJRR Avenue buildings no longer are standing. The other great manufacturing enterprise to occupy the southeast corner of the stadium area was the Hewes and Phillips Co., one of the nation's leading machinery companies in the second half of the 19th century. The company was founded by Joseph L. Hewes and John M. Phillips, former employees of Seth Boyden, who initially rented a portion of the Oby Meeker Company (the Union Iron Works). By 1840, the company employed 40 men. In 1858 the partners purchased the northern half of the Union Works and consolidated their operations on the southwest corner of Orange and Ogden streets (McCarter Highway). With the prosperity brought about by the outbreak of the Civil War and the signing of various military contracts, the number of workers grew to 400 who produced items including the turrets for the Monitor, the Union's ironclad submarine. Hewes and Phillips remained an important concern for the remainder of the 19th century as a major manufacturer of stationary, portable and marine boilers. The firm also made a variety of general machinery and machine parts. From the Hewes and Phillips company dock on the Passaic River, products were shipped worldwide. Joseph L. Hewes died in 1873, and John M. Phillips ran the company until his death in 1884. Work continued there into the 1920s when it was sold to the New Jersey Machinery Exchange and became associated with the Ace Metal Works. Now only the memory remains of one of the manufacturers that carried Newark's name around the world. The Van Duyne and Sherman Atlas of 1869 shows us the site of the old Oraton Hall, 494 Broad Street at the corner of Broad and Bridge streets. From the 1850s until well into the close of the century, it was 'the place' to meet for social occasions and fancy parties for the families who lived in the large homes clustered around Washington Park, a place where cotillions and the annual Bachelor's Ball played to the city's socially elite. During the construction stage, the buildings also served briefly as a home for church activities and Sunday school classes for North Reformed Church. In later years, Oraton Hall declined into a rather undistinguished hardware store, taking on aspects of an Edward Hopper painting. In the 1950s construction of the fourth and final home of Mutual Benefit, with its modern limestone, pale green, chromium and glass skyscraper, gave the area a dramatic new look. Most notably, the 1869 map showed the area's almost complete abandonment as a residential location and its transformation into a place for medium to heavy industry. Along Broad Street there also were commercial overtones. By 1889, the future stadium area changed again with the consolidation of Hewes and Phillips holdings, the emergence of the Quinby Carriage and Automobile Co. and the growth of the Alderney Dairy. J.M. Quinby and Co. was founded in 1834 and described in contemporary industrial histories 'as among the nation's first makers of fine carriages. The name of the founder James M. Quinby is known and honored wherever the fame of American carriage making has gone,' one scribe wrote. The company's founder/owner got his experience as a local apprentice. During his lifetime, he took on several business partners, but the firm never changed its name. Upon his death, the company was sold and the new management was assumed by Quinby's son James, along with partners Isaac S. Ayers and John Jephson. Their expertise kept the company a leader in the changing world. In time, the factory produced all kinds of vehicles, from a light road wagon to a coach or landau, a type of covered carriage. At the height of the company's productive years, Quinby employed more than 100 men and generated an annual income in excess of $130,000. Another enterprise established in the area was the Newark Milk and Cream Company, later the Alderney Dairy. Founded in 1894, it eventually became one of the nation's largest independent milk producers. The company's products were sold throughout Northern New Jersey. By the 1930s Alderney owned 10 large creameries and dealt with more than 800 dairy farms. The basis for its operation were Jersey and Guernsey cows that came from the tiny Channel Islands off the British coast. Alderney had rigid requirements for safety and employed a large staff of trained milk inspectors and experts on the dairy farms. Its cows routinely were tested for tuberculosis and chemists and bacteriologists were called upon to maintain uniform safety of the milk products at all times. A fleet of heavy duty glass-lined trucks and trailers transported milk to the Newark bottling plant, where empty bottles were washed, sterilized by automatic machines, and filled with the pasteurized product. Eventually other plants opened at Asbury Park, Hackensack, Orange, Montclair, Elizabeth and Plainfield. But the Alderney sign and giant milk bottle atop the main plant remained one of the landmarks of Newark. Another well-known company that occupied land where the stadium is going up was the Mennen Company. Its name appeared in a 1911 fire insurance atlas at 42 Orange St. Gerhard Mennen came from Germany at age 22 and bought a drug store in Broad Street in Newark in February 1878. He had become a pharmacist before coming to America. The company Mennen founded developed a line of fine men's toiletries in an era in which there was fierce competition for such items. After his sudden death, his widow, Elma, assumed control until her early death. Their son William then ran the company for nearly a half century. The Mennen success story rested on two principles: the development of a good product and its promotion among a wide audience. In 1914 Mennen developed 'Mennen Talcum for Men,' launching its early entry into the field of men's toiletries. Then Mennen's Shaving Cream revolutionized shaving habits for millions of men. Mentholated shaving cream was introduced in 1927. Liquid shampoo was introduced next, followed by Mennen Skin Bracer and a foot powder for tired feet. The company's success rested on packaging and marketing as well as innovation. Attractive packaging and highly competitive advertising gave Mennen an additional edge over its competitors and beautiful milk white decanter bottles graced thousands of bedroom dressers and home medicine cabinets as well as the neighborhood barbershop. Magazines and newspapers were filled with Mennen advertisements in an attempt to woo male customers. But as success piled upon success, there was a demand for more manufacturing space beyond the original factory at 42 Orange Street. It soon gave way to a larger facility at 345 Central Ave., which was eventually replaced by a new streamlined plant and office in Morristown. William Mennen, who lived first on Rector Street and was a newsboy for the Newark News, was a true Newarker. He attended Burnet Street School and graduated from Newark (Barringer) High School and Cornell University. Over the years, he took the company left to him by his parents to new heights.